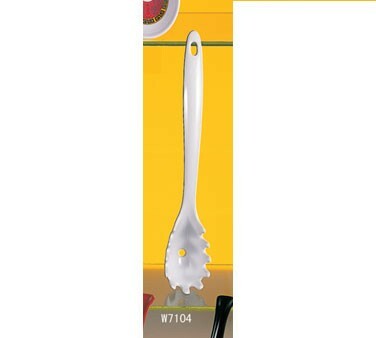 LionsDeal > Cookware > Kitchen Utensils >< Pasta Servers > Thunder Group W7104 White Melamine One-Piece Pasta Fork 12"
Thunder Group W7104 White Melamine One-Piece Pasta Fork 12"
Serve fettuccine and linguine easily with the Thunder Group W7104 White Melamine One-Piece Pasta Fork 12". Designed with prongs, this pasta fork holds noodles while a small hole inside the bowl allows excess gravy and sauce to drain away. Manufactured from melamine, this pasta fork is exceptionally durable and its white hue makes it suitable for any buffet or catered event. In addition, its long handle provides a well-balanced grip and its hang-hole makes it easy to store.